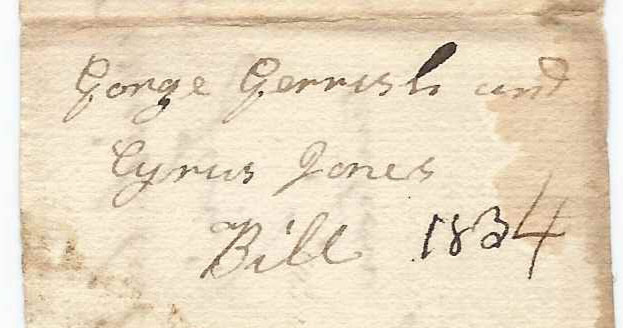 January 20, 1834 handwritten document with the names of Captain George Gerrish and Cyrus Jones. The document may have been written at Lebanon, Maine, where a Captain George Gerrish and a Cyrus Jones lived during that era. Capt. George Gerrish bill for wood and repairs in Dist. No. 4. is $12.25 dated January 20th 1834. Cyrus Jones for tuition in No. 5 is $7.50. I'm trying to figure out the purpose of this document and could use your input. Was it a document made by an unnamed teacher who was asking to be reimbursed by Captain George Gerrish for wood and repairs the teacher had made, and also asking for the tuition owed by Cyrus Jones? Was it a document where Cyrus was billing for the cost of wood and repairs that Captain George Gerrish owed him, perhaps in his capacity as school agent, and also noting the $7.50 that was to be deducted to cover the tuition of Cyrus' own children? Was it a document written by the town treasurer noting amounts owed and to be collected from Capt. George Gerrish and Cyrus Jones? There was a Captain George Gerrish who was born at Dover, New Hampshire, on October 19, 1775, the son of George and Mary (James) Gerrish. The year after young George's birth, the family moved to Lebanon, Maine. The "Captain" designation came from the younger George's service in the York County, Maine, Militia. He died at Chelsea, Massachusetts, on January 26, 1850. There was a Cyrus Jones born at Lebanon, Maine, on May 18, 1812, the son of Stephen and Eunice Jones. At the time of the 1850 Census, he was living at Somersworth, New Hampshire with his mother Eunice and wife Sarah W. Cyrus and Sarah later moved back to Lebanon, Maine, and were enumerated there up through the 1880 Census. Cyrus died on 27 August 1895 at Lebanon, Maine. If you have corrections and/or additions to the above information, or if you feel that this document was written somewhere other than Lebanon, Maine, please leave a comment or contact me directly.